Casket bearers were Steven VonBerge, David VonBerge, Bill VonBerge, Paul Lemke, Aran Jozwick, Robert VonBerge, Warren VonBerge, Ross Schochenmaier, Eric VonBerge, Jessie Richards, Dan Brinkman and Doug Closs. Interment was in the St. John’s Evangelical Lutheran Cemetery in Helen Township, Glencoe. Alice Emma (Werth) VonBerge Stuedemann was born Aug. 6, 1916, in Bergen Township, McLeod County, the daughter of Fredrich and Clara (Tonn) Werth. She was baptized as an infant on Aug. 20, 1916, by the Rev. Baumhoefner, and was confirmed in her faith as a youth on April 13, 1930, by the Rev. Schert, both at St. Peter’s Lutheran Church in St. Peter. She received her education through eighth grade at a country school. On May 28, 1939, she was united in marriage to Ernst VonBerge by the Rev. Schert at St. Peter’s Lutheran Church in Lester Prairie. Their marriage was blessed with four sons, Earl, Ronald, Gary and Robert. They made their home on the family farm in rural Sibley County until 1964, when her husband joined the school system and they moved to Glencoe. Alice worked at the Coast to Coast store for three years and then joined her husband working at the Glencoe Public School for 10 years. The couple shared over 33 years of marriage before Mr. VonBerge’s death on May 9, 1973. On Sept. 5, 1981, she was united in marriage to Walter Stuedemann by the Rev. Kath at First Evangelical Lutheran Church in Glencoe. The couple shared over 13 years of marriage before Mr. Stuedemann’s death on Dec. 7, 1994. In addition to being a loving wife and mother, she was a homemaker. 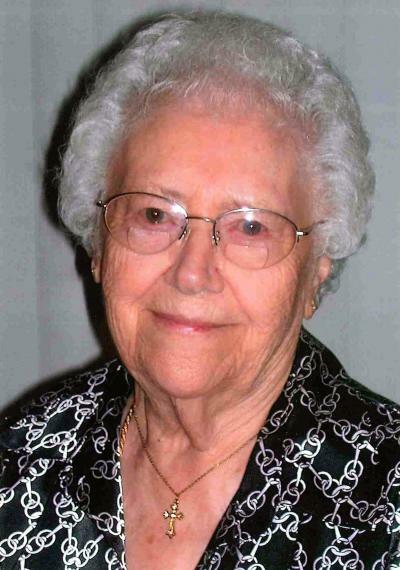 She was an active member of First Evangelical Lutheran Church in Glencoe, where she served on the Ladies Aid and was a member of the quilting ladies. Mrs. Stuedemann enjoyed crocheting on hand towels and sewing quilts and crocheting afghans for her children and grandchildren. She loved gardening, fishing and traveling. She cherished the time spent with her friends and family, especially attending her great-grandchildren’s birthday parties. She is survived by her sons, Earl (Dellas) VonBerge of Glencoe, Ronald (Jeanie) VonBerge of Brownton, Gary (Cindy) VonBerge of Hutchinson and Robert (Dianne) VonBerge of Glencoe; 15 grandchildren; 34 great-grandchildren; sister-in-law, Aurelia Werth of Glencoe; nephews, nieces, other relatives and many friends. She was preceded in death by her parents, Fredrich and Clara Werth; first husband, Ernst VonBerge; second husband, Walter Stuedemann; brothers, William (Mathilda) Werth, Gilbert (Elda) Werth and Fredrick Werth; sister, Lenora (Edward) Kern; sister-in-law, Gladys (husband Loren) (VonBerge) Roepke. Arrangements were with the Johnson McBride Funeral Chapel of Glencoe. Online obituaries and guest book are available at www.hantge.com.